Department of Laboratory Sciences, College of Sciences and Arts at Al-Rass, Qassim University, PO Box 53, Saudi Arabia. Citation: Abdallah EM. Preliminary Phytochemical and Antibacterial Screening of Methanolic Leaf Extract of Citrus aurantifolia. Pharm Biotechnol Curr Res. 2016, 1:1. The phytochemical constituents and antibacterial effects of the methanolic leaf extract of Citrus aurantifolia were evaluated in the present study. The samples were collected from the Sudan, Khartoum province. Methanol was used as the solvent for extract preparation, which was further, implemented for antibacterial and phytochemical assays. The in vitro antibacterial activity assay was performed by agar disc diffusion method. 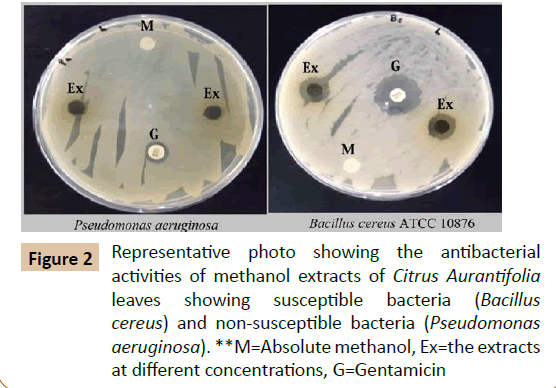 The results showed that the methanolic leaf extracts possessed significant antibacterial activity against Bacillus cereus ATCC 10876 (referenced strain). Other strains used were multi-drug resistant clinical isolates (Staphylococcus aureus, Proteus vulgaris, Pseudomonas aeruginosa and Klebsiella pneumonia). The results showed weak or no susceptibility against the leaf extract, and were found statistically insignificant. The preliminary phytochemical screening of the extract revealed the presence of bioactive agents such as saponins, phenolic compounds and anthraquinones. Further chemical and microbiological characterization is imperative to completely assess the nature and mode of action of the antibacterial compounds and phytochemical constituents of the leaves of Citrus aurantifolia. Plant based products have been used as remedy for the treatment of health complications since ancient times . Till the dawn of the nineteenth century, most of the medical drugs were made from naturally obtained plant products, such as Quinine from Cinchona bark, codeine and Morphine from Papaver somniferum, Digoxin from Digitalis lanata, atropine and hyoscine from various plants belonging to the Solanaceae spp. Even the early antibiotics were produced from natural products, e.g., Penicillum and Cephalosporium from fungi and Streptomyces from bacteria . Recently, microbial infections have become a major international health problem. The conventionally used antibiotics are losing their efficacy against the pathogens. Development of multidrug resistance among the pathogenic microbes has forced the scientific community to search for new antimicrobial compounds from alternative sources such as medicinal plants . Plants are rich in phytochemical compounds which are often denoted as secondary metabolites. The bioactive effects of these metabolites have been studied on animal and human body. It is reported that some of these phytochemicals Such as flavonoids, alkaloids, terpenoids and tannins possess high antimicrobial activities . Citrus aurantifolia (Christm) Swingle (family: Rutaceae) is a well-known medicinal and food plant. It is widely cultivated around the world; and almost all parts of this plant are used in traditional medicine as astringent, diuretic, insect repellent, antiseptic, and antimicrobial for treatment of gastrointestinal ailments, cough, colds and sore throat . The aim of this study was to evaluate the antibacterial activity of the leaves of Citrus aurantifolia, against referenced bacterial strain and multi-drug resistant strains, and screen for the presence of bioactive phytochemical constituents in the leaf extracts. Fresh leaves of Citrus aurantifolia (Figure 1) were collected manually from Khartoum town, Sudan, during August, 2016. After authentication of the plant samples by a taxonomy expert (Dr. Wail Elsadig Abdalla, National Centre for Research, Sudan), leaves were washed thoroughly with running tap water, followed by rinsing with distilled water. The leaf samples were kept in a dark and well-ventilated cabinet to dry out the extra water. The dried leaves were then grinded into a fine powder and stored in a closed dark container for further analysis. 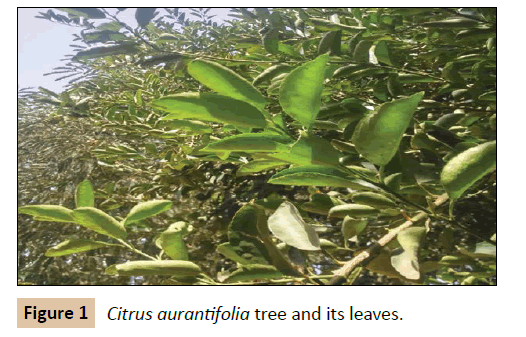 Figure 1 Citrus aurantifolia tree and its leaves. The dried powder of Citrus aurantifolia leaves was used for extract preparation. The powder was macerated using absolute methanol (HPLC grade, Fisher Scientific, UK). 50 grm of the leaf powder was soaked in 500 ml of methanol (1:10) in a closed glass container with frequent shaking and kept in an incubator at 37°C for a week. After that, the macerate was filtered with Whatman filter paper No.1 (Whatman International Ltd, UK). The filtrate was placed in the incubator and allowed to evaporate at 45°C for up to 10 days until a semi-solid extract was obtained; it was put in the oven 60°C for several hours until totally dried. The dried extract was scraped, collected and kept in a closed dark container in the refrigerator (4°C) until further use in phytochemical and antibacterial testing. All the described laboratory experiments were carried out in the department of laboratory sciences, College of Sciences and Arts at Al-Rass, Qassim University, Saudi Arabia. The methanolic extract of the leaves of Citrus aurantifolia was screened for the presence of bioactive phytochemical compounds. The dried crude of methanolic extract was used to detect the presence of terpenoids and flavonoids , Phenolic compounds , saponins and anthraquinones , alkaloids  and tannins . Test for terpenoids (Salkowski test): To 200 mg of the dry crude extract, 2 ml of chloroform and 3 ml of concentrated sulphuric acid were added. Formation of a reddish brown colour is an indication of the presence of terpenoids . Test for flavonoids: In a clean test tube, 5 ml of dilute ammonia solution was added to 2 ml of the extract solution. Few drops of concentrated sulphuric acid (H2SO4) also carefully added to the tube. Formation of yellow colour is an indication of presence of flavonoids . Test for phenolic compounds: 1 ml of the methanol extract was treated with 10% ethanolic ferric chloride. Change in colour from blue green to dark blue is an indication of the presence of phenolic compounds . Test for saponins: 5 ml hot distilled water (60°C) was mixed with 1 ml of the Extract solution and shaken vigorously for 2 minutes. The tube was left for a while and the test tube was checked for the presence or absence of frothing formation as an indication of presence of saponins . Test for alkaloids (Mayer’s test): To a test tube containing 1 ml of methanol extract, Mayer’s reagent (1 ml) was added (Freshly prepared by dissolving a mixture of 1.36 g mercuric chloride and of 5 g potassium iodide in water and the final volume was made 100 ml) drop by drop. Formation of a creamy (Buff) coloured precipitate indicates the presence of alkaloids . Test for tannins: To a test tube containing 2 ml of the extract solution, few drops of 1% of gelatine solution containing 10% sodium chloride (NaCl) was added. Formation of white precipitate is an indication of presence of tannins . Test for anthraquinones (Bornträger’s test): To a test tube containing 2 ml of the extract solution, 4 ml of hexane was added, followed by rigorous shaking. The test tube was left for about 10 minutes, after which the upper lipophilic layer was transferred to another clean test tube and 4 ml of dilute ammonia solution was added. A change in colon of the lower layer from pink to violet is an indication of presence of anthraquinones . Pathogenic bacteria: Referenced bacterial strain, Bacillus cereus ATCC 10876 was provided from the Department of Laboratory Sciences, College of Sciences and Arts, Al-Rass, Qassim University, Saudi Arabia. Other bacteria were multi-drug resistant clinical isolates, which were collected and identified routinely in June 2016 by Dr. Mohamed Elgadi in Al-Rass General Hospital, Pathology and Laboratory medicine, Saudi Arabia. The drug resistant clinical bacterial isolated were identified as Staphylococcus aureus, Proteus vulgaris, Pseudomonas aeruginosa and Klebsiella pneumonia. All identified bacteria were maintained on Mueller Hinton agar slants (HIMEDIA, India) and kept in a refrigerator at 4°C. Preparation of inoculums: To prepare the working cultures, the test bacteria were sub-cultured in nutrient broth (HIMEDIA, India) for 18 hours at 37°C to reach the exponential phase. The working cultures were adjusted to 0.5 McFarland’s standard, using sterile normal saline, in order to get bacterial density equivalent to approximately 1.0 × 108 cfu/ml, and were directly used in the antibacterial activity assay. Disc diffusion test: The antibacterial activity of the methanolic leaf extract of Citrus aurantifolia was evaluated using the modified Kirby-Bauer disc diffusion method as mentioned elsewhere , 20 ml of warm Mueller Hinton agar (Watin-Biolife, KSA), was poured onto sterile disposable plates (Jalil Medicals, Bahrain) and left at room temperature until solidified. The plates were then turned upside down and kept in the refrigerator for about half hour. 100 μl of the bacterial suspensions, which were previously adjusted to 0.5 McFarland’s standard were gently spread on the surface of the solidified Mueller Hinton plates, using sterile cotton swabs. Sterile blank discs of 6 mm which were previously prepared from Whatman No.1 filter paper (Sigma-Aldrich, UK) were saturated with the re-constituted extract at a concentration 200 mg/ml to trap approximately 4 mg of the extract/disc. The discs were then mounted onto the already inoculated plates. Gentamicin disc (10 μg/disc) (Oxford, UK), was used as positive control, while another disc saturated with the solvent (80% methanol) was loaded in the plate and served as negative control. Plates were incubated at 37°C for 24 hrs. The susceptibility of the bacteria towards the extract was expressed as the zones of growth inhibition in millimetre (mm), measured using a transparent ruler. The tests were repeated twice to get the mean zone of inhibition. Statistical analysis: All the statistical analyses (means, standard error of means and one-way ANOVA with Tukey’s Post Hoc) were performed with the SPSS package, version 17.0 (SPSS Inc., Chicago, USA), variables considered significant at P<0.05. The results of the preliminary phytochemical screening of the methanolic extract of the leaves of Citrus aurantifolia are shown in Table 1. The results obtained showed existence of saponins, phenolic compounds and anthraquinones, while tannins, alkaloids, flavonoids and terpenoids were not detected in any of the samples. This is in agreement (in partial) with Reddy in 2012 , who reported the presence of phenolic compounds and saponins are detected in the current study. Additionally, the presence of alkaloids, tannins and flavonoids in the methanolic leaf extract of Citrus aurantifoliawas also detected. The leaf samples used by Reddy  were collected from India. The difference in the results could be related to many reasons, such as the method of extraction, difference in the geographical locations and environmental conditions, etc. It is proposed that any change in the climate may alter the chemical composition of the plant . Moreover, in extraction processes each solvent having its own capability to dissolve specific phytochemical constituents, based on the nature and the polarity of the compound . The results of the antibacterial activity of the methanolic leaf extract of Citrus aurantifolia are shown in Table 2 and Figures 2 and 3. The methanolic leaf extracts (8 mg/disc) showed the presence of antibacterial properties against the reference strain. The extract at the concentration 4 mg/disc also showed convergent antibacterial effects against Bacillus cereus ATCC 10876 (12.0 ± 1.0 mm), Staphylococcus aureus (7.0 ± 1.0 mm), very weak effects against Proteus vulgaris and Klebsiella pneumonia (6.5 ± 0.5mm) and no effect against Pseudomonas aeruginosa (6.0 ± 0.0 mm). The results obtained were statistically significant (PÃÂ0.05) against Bacillus cereus ATCC 10876. Although certain degree of bacterial activity was seen other pathogens but the results were not statistically significant (Table 2). The mean zone inhibition measurements at the concentration 8 mg/disc are Bacillus cereus ATCC 10876 (13.0 ± 0.0 mm), Staphylococcus aureus (8.5 ± 0.5 mm), Proteus vulgaris (8.0 ± 0.5 mm), Pseudomonas aeruginosa (7.0 ± 1.0 mm) and Klebsiella pneumonia (7.0 ± 1.0 mm), respectively. Compared with the antibiotic Gentamicin (10 µg/disc) which recorded antibacterial effects against; Staphylococcus aureus (23.0 ± 1.0 mm), Bacillus cereus ATCC 10876 (20.0 ± 1.0 mm), Proteus vulgaris (9.0 ± 1.0 mm), Pseudomonas aeruginosa (8.5 ± 0.5 mm) and Klebsiella pneumonia (8.5 ± 0.5 mm), respectively. The recommended zone of inhibition to be considered as a potential antibacterial extract ÃÂ10 mm zone of inhibition (diameter of the test discs - 6 mm) . The real antibacterial effect can be demonstrated as shown in Figure 3. On the other side, it is noted from the results that, gentamicin as an effective broad-spectrum aminoglycoside antibiotic which is losing its efficacy due to the development of multi-drug resistant pathogens. 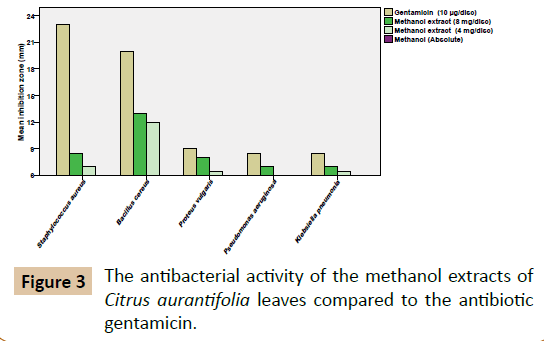 Figure 3 The antibacterial activity of the methanol extracts of Citrus aurantifolia leaves compared to the antibiotic gentamicin. Table 1 Some phytochemical constituents of the methanol extract of Citrus aurantifolia leaves. Table 2 Antibacterial effect of the leaves of Citrus aurantifolia (methanol extrac) against different pathogens. *Disc diameter=6 mm, zone off inhibition is the mean of two replicates ± standard error of means. 6 mm=no inhibition. **Significant result (PÃÂ0.05), Sa=Staphylococcus aureus, Bc=Bacillus cereus ATCC 10876, Pv=Proteus vulgaris, Pa=Pseudomonas aeruginosa, Kp=Klebsiella pneumonia. According to a recent study, Citrus auraantifolia fruits and leaves possess antibacterial activity against Escherichia coli, Burkholderia sp., Haemophilus somnus, Haemophilus parasuis, but no significant antibacterial activity was observed against Clostridium perfringens . Previous studies reported that, the hydrosols extracts (obtained by hydro-distillation) of Citrus aurantifolia leaves and peels has antimicrobial effects against referenced microbial strains (Candida albicans ATCC 10239, Bacillus subtilis NTCC 10073, Escherichia coli ATCC 25922, Enterococcus faecal is ATCC 29212) . The hydro-alcoholic leaf extract of Citrus aurantifolia have been reported to possess antibacterial properties against Klebsiella pneumonia, Pseudomonas spp and Staphylococcus aureus . Accordingly, the study of antimicrobial activity of Citrus aurantifolia leaves collected from different seasons (flowering, fruiting, dry season, etc.) against wide spectrum of microorganisms could help in the detection of the effective antimicrobial agents of this promising plant. Citrus aurantifolia is an important plant with varied domestic and ethno pharmacological applications. The fruit of the plant (Key lime) has economic importance. The leaves find many applications in traditional medicine. The current study was made on the leaves of Citrus aurantifolia, and the results revealed the presence of significant antibacterial activity against Bacillus cereus ATCC 10876. However, the plant extract was not found effective against other multi-drug resistant clinical strains. The phytochemical screening revealed the presence of some bioactive compounds. Further phytochemical and pharmacological studies are required to understand the nature of the antibacterial agents present in the leaves, which may explain the mode of action and provide the correct explanation, to why this extract was active only against the referenced bacterial strain. The Author would like to thank Dr. Mohamed Elgadi from AlRass General Hospital for providing some multi-drug resistant clinical bacterial isolates. Abdallah EM (2011) Plants: An alternative source for antimicrobials. J Appl Pharm Sci 1: 16-20. Phillipson JD (2001) Phytochemistry and medicinal plants. Phytochemistry 56: 237-243. Deshpande SN (2013) Preliminary phytochemical analysis and in vitro investigation of antibacterial activity of Acacia nilotica against clinical isolates. Journal of Pharmacognosy and phytochemistry 1: 23-27. Cowan MM (1999) Plant Products as Antimicrobial Agents. ClinMicrobiol Rev 12: 564-582. Enejoh OS, Ogunyemi IO, Bala MS, Oruene IS, Suleiman MM, et al. (2015) Ethnomedical Importance of Citrus Aurantifolia (Christm) Swingle. The Pharma Innovation Journal 4: 01-06. Mujeeb F, Bajpai P, Pathak N (2014) Phytochemical evaluation, antimicrobial activity, and determination of bioactive components from leaves of Aeglemarmelos. BioMed Research International. Hindawi Publishing Corporation 2014: 11. Clarke C, George EC (1975) Isolation and identification of Drugs. The pharmaceutical Press, London, UK. Stahl E (1973) Drug analysis by Chromatography and Microscopy. Ann Arbor Scientific Publishers, Inc., Michigan, USA. Yusuf AZ, Zakir A, Shemau Z, Abdullahi M, Halima SA (2014) Phytochemical analysis of the methanol leaves extract of Paulliniapinnata lin. Journal of Pharmacognosy and Phytotherapy 6: 10-16. Ashfaq M, Shah KW, Ahmad S, Singh D (2012) Preliminary phytochemical screening of alcoholic and aqueous extracts of Menthalongifolia Linn. Leaves. International Journal of Biological & Pharmaceutical Research 3: 384-386. Abdallah EM (2016) Antibacterial Efficacy of Acacia nilotica (L.) Pods Growing in Sudan against Some Bacterial Pathogens. Int J Curr Res Biosci Plant Biol 3: 6-11. Reddy LJ, Jalli RD, Jose B, Gopu S (2012) Evaluation of Antibacterial & Antioxidant Activities of The Leaf Essential Oil & Leaf Extracts of Citrus Aurantifolia. 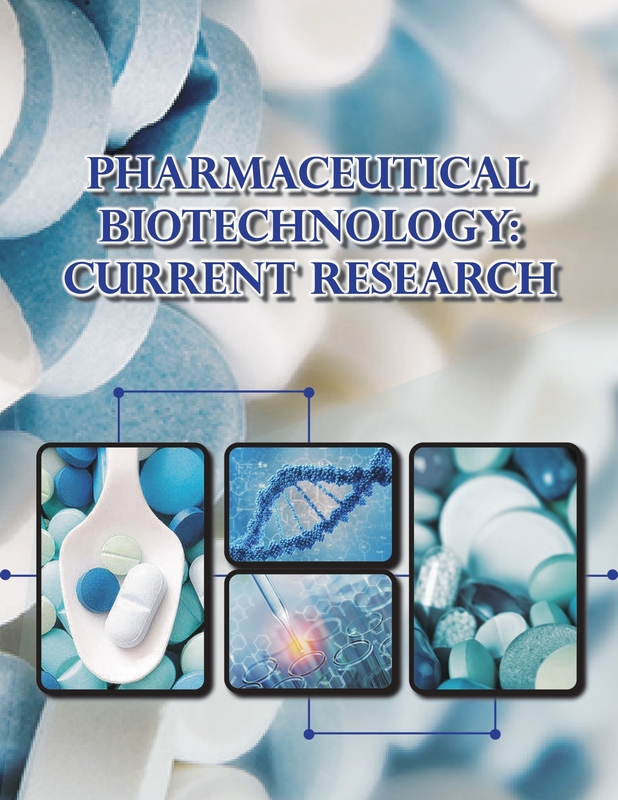 Asian Journal of Biochemical and Pharmaceutical Research 2: 346-354. AbdElgawad H, Peshev D, Zinta G, Ende WV, Janssens IA, et al. (2014) Climate Extreme Effects on the Chemical Composition of Temperate Grassland Species under Ambient and Elevated CO2: A Comparison of Fructan and Non-Fructan Accumulators. PLoS One 9: e92044. Pathan RK, Gali PR, Pathan P, Gowtham T, Pasupuleti S (2012) In vitro Antimicrobial Activity of Citrus aurantifolia and its Phytochemical Screening. Asian Pacific Journal of Tropical Disease S328-S331. Abdallah EM, Al-Harbi KA (2015) Phytochemical screening and antibacterial activity of crude aqueous and ethanol extracts of Salvadorapersica L. stem (Miswak) from Saudi Arabia. The Journal of Phytopharmacology 4: 243-247. Lee JH, Cho S, Paik HD, Choi CW, Nam KT, et al. (2014) Investigation on Antibacterial and Antioxidant Activities, Phenolic and Flavonoid Contents of Some Thai Edible Plants as an Alternative for Antibiotics. Asian Australa J Anim Sci 27: 1461-1468. Acheampong A, Borquaye LS, Acquaah SO, Osei-Owusu J, Tuani GK (2015) Antimicrobial Activities of Some Leaves and Fruit Peels Hydrosols. International Journal of Chemical and Biomolecular Science 1: 158-162.